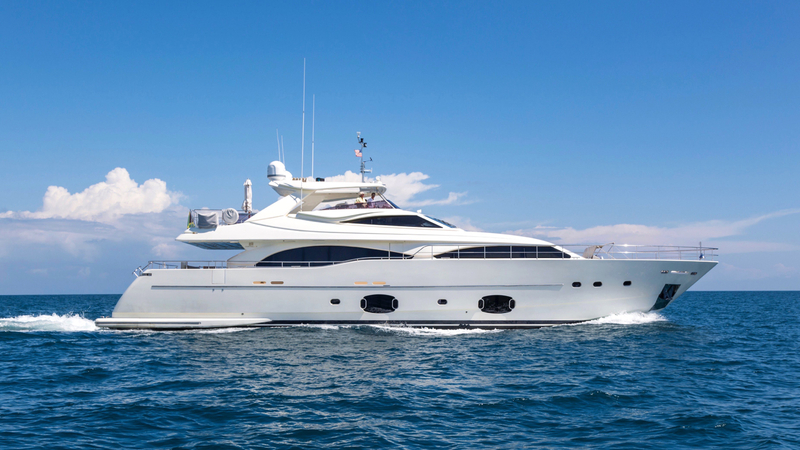 Built in 2008 with a recent refit in 2018, The Capital is a custom line 97’/29.57m Ferretti in beautiful condition. She is able to welcome up to eight guests and has four luxurious cabins on board, all well-appointed and generously proportioned. These include the on deck full beam Master with walk in closet, which is a welcoming space that will delight. Three more ensuite cabins, with an extra Pullman for added versatility for groups, boast large windows that fill each space with natural light and offer views out on to the ocean. Interior décor is elegant and stylish, with a light color scheme paired with polished woods, leather and marble. Enjoy the Bahamas and Caribbean on board this beautiful yacht and be looked after by her experienced crew. The Capital awaits you. 6x chairs, table, propane grill, gazebo, plenty of coolers! A large main saloon is at the heart of the yacht and is an ideal space for guests to gather in, with a formal dining table, wine cooler, lounge seating and an entertainment system. The main saloon has fantastic indoor outdoor flow, connecting directly to the main aft deck and down to the transom with its popular beach club set up. The beach club is the perfect spot for enjoying a range of water activities, with guests able to choose from The Capital’s large selection of brand new water toys, or simply enjoy relaxing right on the water level. The Capital is a yacht that is well suited to enjoying the warm climate of the Bahamas and Caribbean, with the beach club just one of the extensive outdoor spaces for guests to retreat to. The hardtop flybridge is a versatile space with U-shaped seating and a table, a bar, sun pads and sun loungers. Forward of the flybridge is another private space with sunpads for guests to relax in the sunshine. The Capital cruising at an impressive 24 knots, with maximum speeds of 27 knots. ARG stablizers ensure excellent comfort when at anchor and underway.